Anybody of you who worked in a (bigger) project, might have noticed that there are always problems about specific factors like time, money and quality. While getting my Scrum Master certificate, our teacher told us about something called the "project triangle". There is a wikipedia article about the project triangle. In any project, time mostly means that there is a deadline that should not be broken. If there is not much time at all or it gets reduced, it means there is less effort for the result which leads to less quality. The customers who pays for your work, always wants to pay less as possible. But reducing cost means reducing manpower and ignoring better solutions. That also leads to less quality. Reducing scope of the project. Doing less as you should or doing it in a sloppy way. As long as the customer does not notice, there is no real problem, till the moment when something is broken or needs refactoring. Quality = Time * Scope * Cost. 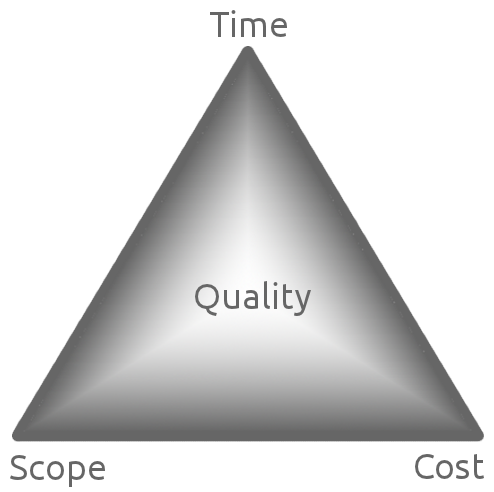 If you reduce any of the 3 factors, quality will decrease. In the end, quality is what the customers pay for. Nobody would by a car that will break down in the first turn. Some explanations about this concept say, you can always just pick 2 of the factors to concentrate. I do not agree with that because it makes the whole problem way too easy. There are ways to solve this so the best possible product is created. I count agile development like scrum and kanban to this. Geschrieben am Sonntag, 19. Juni 2011 und abgelegt unter Allgemein. Verfolgen Sie die Diskussion zu diesem Beitrag per RSS 2.0 Feed. Die Kommentarfunktion wurde deaktiviert. Auch das "Anpingen" des Beitrages ist nicht möglich.